Thank you. We have received your Enquiry. In the Beginning of the last century; a young scholar, erudite writer and educationalist - Professor Sohrab Davar, had a dream of providing an exceptionally strong foundation of education dedicated solely to the commerce industry. Thus was laid the foundation stone of "DAVAR'S COLLEGE"; an Educational Institute that today flaunts a century of glorified history, with many present luminaries as its past students. Timings : 8:30 am to 12:30 pm / 2:45 pm. Weekdays Batch Monday to Friday. Sunday Batch : 7th April, 28th April, 5th May, 19th May, 26th May, 9th June, 30th June, 2019 Can Join Any Sunday Rolling Batch. Level 2 Intermediate Commencing : April / May 2019 Batch. "I did my Millenium Secretary Course as well as Human Resource Management from Davars Only. It Completely changed me, rather transformed me into best ever person. I perfectly owe my success, my happiness to Siloo Chinigar Maam, Cabral Sir, Ayaaz Sir and Shane Sir a lot…… very proud to be student from Davars College." "My experience at Davar's has been really exceptional. The course has given me an insight into the business world and has also provided me with personal development, I feel." "I have always felt that at Davars, the management puts their faith in people who perform, which in turn helps us to develop our skills so that we can rise up to the challenge and deliver to the expectations of our seniors. 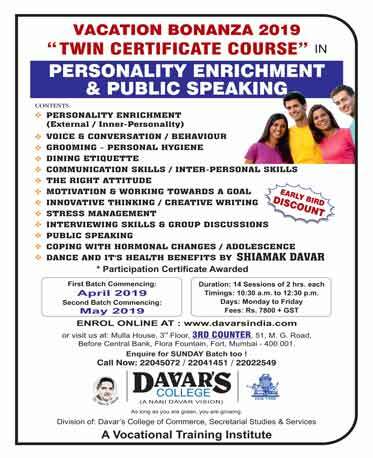 I was a student at Davars 8 years ago, and I am very thankful to them for helping me connect with my current employer, where I have grown professionally, I have not only learnt the nuances of handling a business but also been able to witness the different stages of business at different levels. A Big thank you once again in advancing my career." "This is the right place to achieve your goals, your aims. To make your future bright in Corporate world." "It is where I did my Secretarial Course and managed to make a future for myself. I attended it in 1975. I was the best in Typing Speed and the motivation came from there.. I love the Grooming and Personality Development Classes too."